It is possible (but not certain) that Constantine's mother, Helena, exposed him to Christianity; in any case he only declared himself a Christian after issuing the Edict of Milan. 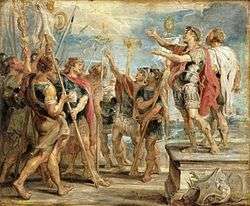 Writing to Christians, Constantine made clear that he believed that he owed his successes the protection of that High God alone. 1 2 3 R. Gerberding and J. H. Moran Cruz, Medieval Worlds (New York: Houghton Mifflin Company, 2004) p. 55. ↑ Brown, Peter (2012). The Rise of Western Christendom: Triumph and Diversity, A.D. 200-1000, 10th Anniversary Revised Edition: Triumph and Diversity, A.D. 200-1000. Making of Empire. 3 (3 ed.). John Wiley & Sons. ISBN 9781118338841. Retrieved 2012-08-08. Constantine was not a young convert. He was over 40 and an experienced politician when he finally declared himself a Christian. He had had time to take the measure of the new religion and the difficulties which emperors had experienced in suppressing it. He decided that Christianity was a religion fit for a new empire. 1 2 3 4 Peter Brown, The Rise of Christendom 2nd edition (Oxford, Blackwell Publishing, 2003) p. 60. 1 2 3 MacMullan 1984:49. ↑ Herbermann, Charles, ed. (1913). "Eusebius of Nicomedia". Catholic Encyclopedia. New York: Robert Appleton Company. ↑ Moffett, Samuel H. (1992). A History of Christianity in Asia: Beginnings to 1500. p. 140. ↑ Clapp, Rodney (1996). A Peculiar People. InterVarsity Press. p. 23. What might be called the Constantinian shift began around the year 200 and took more than two hundred years to grow and unfold to full bloom. ↑ Yoder, John H. (1996). "Is There Such a Thing as Being Ready for Another Millennium?". In Miroslav Volf; Carmen Krieg; Thomas Kucharz. The Future of Theology: Essays in Honor of Jurgen Moltmann. Eerdmanns. p. 65. The most impressive transitory change underlying our common experience, one that some thought was a permanent lunge forward in salvation history, was the so-called Constantinian shift.